Ketosis is a metabolic process that occurs in the body when there isn't enough glucose to use for energy and fat is burned instead. This physiological state is defined by elevated ketone levels in the body. Ketosis is easy to induce when you follow ketogenic diets, which are essentially low-carb, high-fat diets. Ketosis can help you lose weight and manage various medical conditions, but it's important to understand how it affects the body before starting a ketogenic diet. Ketogenic diets are low-carbohydrate diets that require a higher-than-average consumption of fat and increased consumption of protein. 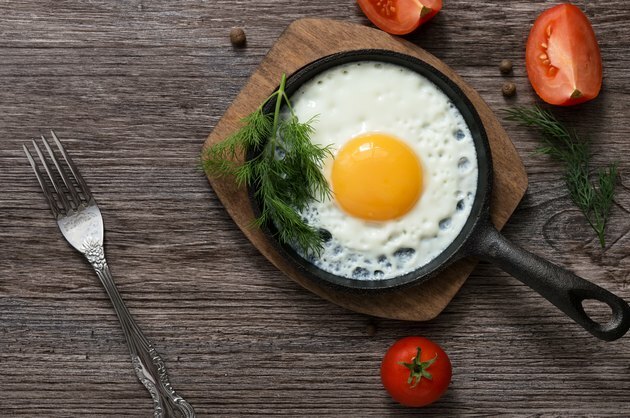 These diets have become increasingly popular in recent years, though they've been studied and used clinically since the 1920s. In general, ketogenic diets differ from other low-carbohydrate diets, as they dictate that adherents consume only 20 to 50 grams of carbohydrates per day. This extremely low carb intake induces ketosis, a physiological mechanism that occurs only when the body has insufficient glucose to supply the central nervous system with energy, and fat must be utilized instead. The standard ketogenic diet (SKD): SKD is a very low-carbohydrate diet that involves moderate protein consumption and high quantities of fat. Typical ratios for this diet are 10 percent carbohydrate, 20 percent protein and 70 percent fat. The cyclical ketogenic diet (CKD): CKD is a standard ketogenic diet that involves periods of higher carbohydrate consumption. Followers of these diets adhere to the SKD version five days per week, then take two days during which higher amounts of carbohydrates are consumed, although variations exist. The targeted ketogenic diet (TKD): TKD allows followers to add additional carbohydrates based on periods of intense physical exertion. The high-protein ketogenic diet (HPKD): HPKD involves higher consumption of protein compared to the SKD. Typical ratios for this diet are 5 percent carbohydrate, 35 percent protein and 60 percent fat — so essentially fewer carbs and less fat than the SKD. People select different ketogenic diets based on medical reasons, weight-loss purposes, enhanced athletic performance or other factors. Ketogenic diets are frequently consumed over short-term periods for fat-reduction and muscle-building purposes. They rarely need to be continued over long-term periods unless you have a medical condition. In addition to these beneficial effects, the ketogenic diet can be used to modify hormonal and metabolic responses in the body. Altering these responses not only has clinically useful effects in disease management, but can be used to improve athletic performance and promote weight loss and muscle building in healthy individuals. These effects tend to result in increased energy levels that make ketogenic diets extremely appealing to a variety of people. There are also cognitive benefits to ketogenic diets. Ketogenic diets have been shown to improve alertness, working memory, visual attention and the ability to switch between tasks. Positive cognitive effects have been shown in children, adolescents and adults. They occur in both healthy individuals and those with pre-existing health conditions. Why Does Ketosis Have Benefits? Ketosis occurs when there isn't enough glucose for the body to use for energy and fat is used instead. Many of the benefits of the ketogenic diet are attributed to ketosis. Because ketosis is based around elevated levels of ketones in the body, alternative methods of raising ketone levels and producing ketosis have been attempted. However, ketone supplements that supposedly induce ketosis more easily and rapidly do not result in the same benefits as adherence to the diet. Why ketosis induces so many positive effects is not fully understood. It may act as a stressor, mimicking starvation. However, the ketogenic diet still provides the body with adequate nutrition for survival, resulting in positive metabolic and hormonal changes. Alternatively, ketosis may simply mimic diets consumed by our ancestors, resembling dietary patterns closer to our bodies' needs from an evolutionary perspective. Ketosis could mimic a much more natural state — one that has been altered by the availability of food, nutrients and the growing popularity of the carbohydrate-rich Western diet. Ultimately, regardless of the reason behind the benefits of ketosis, it has undisputed effects on metabolism and hormones. Many of the benefits of ketosis are based on its ability to impact cellular metabolism, essentially targeting mitochondria, the powerhouse of the cell. Hormone levels, including corticosteroid and thyroid hormones, are also substantially impacted. These hormones influence aspects of the body like the immune system, regulating inflammation and even potentially increasing lifespans. Despite all these benefits, the ketogenic diet is fairly strict and can be difficult to follow, especially for long periods of time. The high fat content of this diet can make it particularly difficult to adhere to. Making sure that you're consuming primarily healthy fats (like the healthy omega-3 fats found in fatty fish) and not just saturated fats can also be particularly challenging. Entering ketosis can initially be unpleasant and comes with a range of side effects. It's also possible to easily exit ketosis. This means that cheating by eating anything carb rich — from a mango to a meal with rice — can disrupt your diet. This is one of the main reasons that cyclical ketogenic diets are becoming increasingly popular: They offer many of the benefits of ketosis while allowing you to maintain a balanced lifestyle. Essentially, they allow you to incorporate the foods you typically avoid, which is important for long-term diet adherence from both a nutritional and psychological perspective. Most people who consume ketogenic diets don't do so for long durations. This is because the effects of the ketogenic diet can be seen at their peak after about one to two months of adherence. After this point, the positives of the ketogenic diet for healthy people and athletes can often start to plateau. Once your body gets used to ketosis, gaining muscle mass and losing weight gradually decrease, eventually stopping entirely, which makes continuing such a strict diet undesirable. Short-term adherence to any form of ketogenic diet has few long-term negative health effects for most people. The vast majority of people find that the primary negative to ketogenic diets and ketosis is how your body reacts to the elimination of carbohydrates. This is commonly known as "keto flu" — your body's initial response to carbohydrate elimination and the easiest way to know if you've entered ketosis. Managing your electrolyte levels and staying hydrated can help mediate these side effects. Because "keto flu" lasts only about a week or two as you adjust to ketogenic diet foods and ketosis, it's not considered a serious side effect of the diet. Long-term negatives of the ketogenic diet and ketosis are more relevant to people with specific medical conditions, like Type 2 diabetes and epilepsy. People who adhere to ketogenic diets for clinical reasons may have more serious side effects because they stay on these diets for long periods of time. A 2017 study in the journal Nutrients showed that it is possible to develop conditions such as nonalcoholic fatty liver disease and insulin resistance if you maintain a ketogenic diet for too long. The ketogenic diet was originally designed for children who were unresponsive to epilepsy medications — which means that some people can grow up adhering primarily to this diet. However, the ketogenic diet has the potential to cause poor growth, kidney stones, liver problems, heart problems, nutrient deficiencies (specifically for vitamin D and trace minerals) and other issues in young people. Despite this, few serious side effects have been associated with the ketogenic diet. Entering ketosis can be challenging. The easiest way to induce it quickly is by eliminating as many carbs as possible. Many people also choose to fast to induce ketosis more rapidly. However, a gradual introduction is often better tolerated as it is associated with fewer side effects. As long as you follow the dietary guidelines, you should be able to maintain ketosis. The most challenging part of trying to enter ketosis is identifying appropriate ketogenic diet foods: incorporating high-fat foods, like fatty fish, and eliminating carbohydrate-rich foods, like grains and fruits. Most people think ketosis is easy to achieve — but adhering to the ratios of your ketogenic diet can be challenging due to the high-fat content. Of course, there's a catch here that makes things more complicated: High intakes of certain types of fat may be bad for your health. This means that you need to limit your amounts of trans fat and saturated fat, while increasing your levels of healthy fats in order to maintain both ketosis and a healthy lifestyle. Most adults should limit their trans fats to 5 grams per day and should only consume between 20 and 30 grams of saturated fats per day. This means that your healthy ketogenic diet should have about 35 to 45 grams of healthy, unsaturated fats each day. Foods rich in saturated fats include fatty cuts of meat, milk products and coconut oil. In contrast, healthy mono- and polyunsaturated fats can be found in products like nuts, seeds, avocados, salmon, mackerel and herring. Incorporating healthy fats, like avocado, nuts and fatty fish, into your diet, can help you adhere to the ketogenic diet's strict dietary ratios while still maintaining a healthy diet. Choosing to use primarily healthy fats, like olive oil, seed-based oils like sesame oil and nut-based oils like peanut oil, rather than lard, butter and margarine can also help you increase the number of healthy foods in your diet. Journal of Special Operations Medicine: Ketones and Human Performance. Exercise and Sport Sciences Reviews: Ketogenic Diets for Fat Loss and Exercise Performance: Benefits and Safety? Indian Journal of Medical Research: Ketogenic Diets: Boon or Bane? What Vegetables Can You Eat on the Atkins Diet?